When it’s in good health, the barrel cactus is pretty handsome, and has a very crisp and orderly layout. Deceased, it’s a very unpleasant and alien-looking sight. 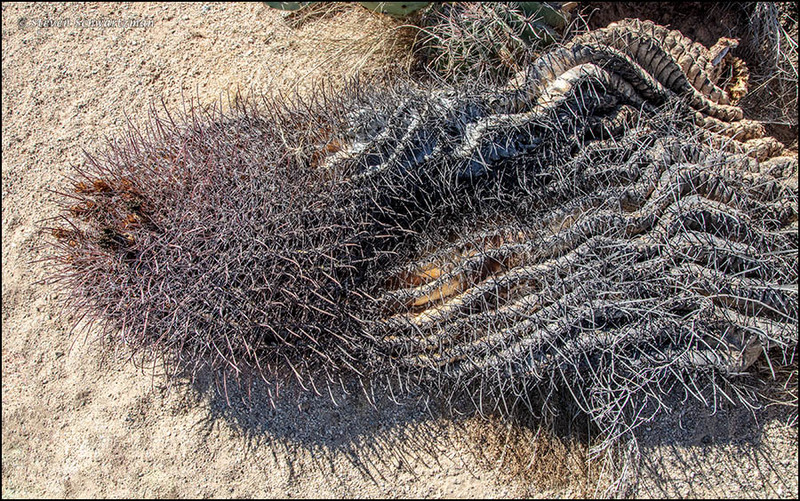 A park ranger told us that a leaning barrel cactus can get so heavy it falls over. I just searched and found out that a good-sized one of these may weigh several hundred pounds. That’s a lot of mass to become unpleasant and alien-looking when it decays. Yuk. At that size, I’d call it a hogshead cactus, it must weigh a tun. It goes to show how efficiently these cacti store water. Splendid live ones! I love the big cactus and I cannot lie! Nobody would ever accuse you of lying, Dianne. Those big cacti are impressive, no doubt about it. A fantastic park – my husband and I were just there earlier this year 🙂 Wonderful shots! We’d been there two years earlier as well, in both sectors. I can understand why this would bring back memories, given how recently you visited the place. The spines on that fishhook cactus really do look like fishhooks. I was idly wondering if anyone ever used the spines in that way, and then it occurred to me that the fishing probably isn’t too good in the middle of the desert. 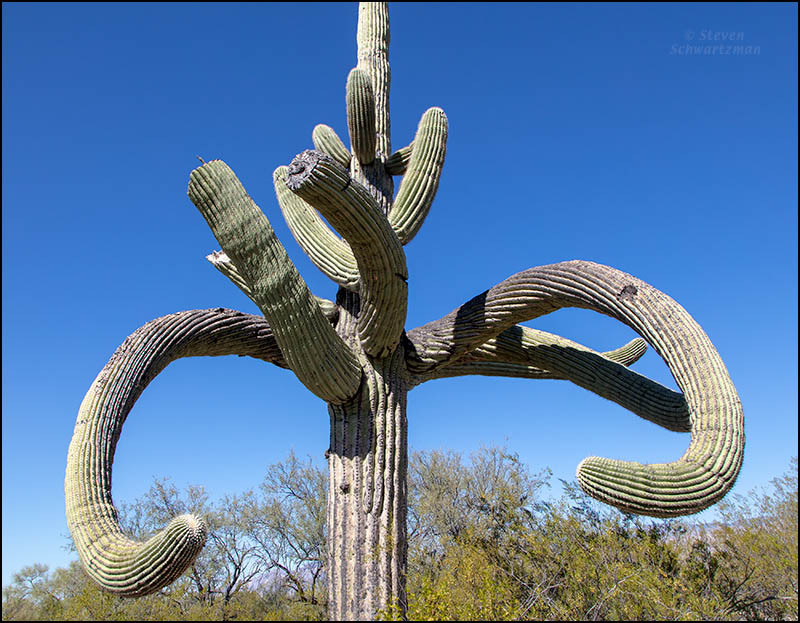 I love the saguaro that looks like it’s karaoke night at Club Cacti, and it’s ready to take the mic for a rendition of “Embraceable You.” On the other hand, the second saguaro looks like another of those Liberian bush devils. It’s missing the stilts, but it has the tall, conical hat. In general fishing wouldn’t be too good there. However, the Colorado River flows across Arizona and a few lakes dot the landscape here and there. While I wouldn’t want to be embraced by a saguaro, some animals embrace those giant cacti as good places for their nests. No stilts for Mr. Saguaro. 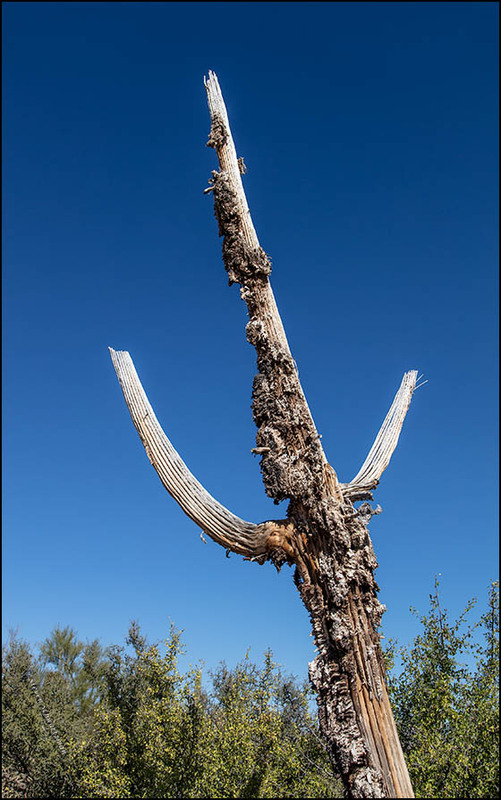 As for devils, some people found the cholla cactus in the previous post diabolical. Oh, and how could I have forgotten Mount Diablo from a week ago? That is one species of the desert that I have not yet seen. 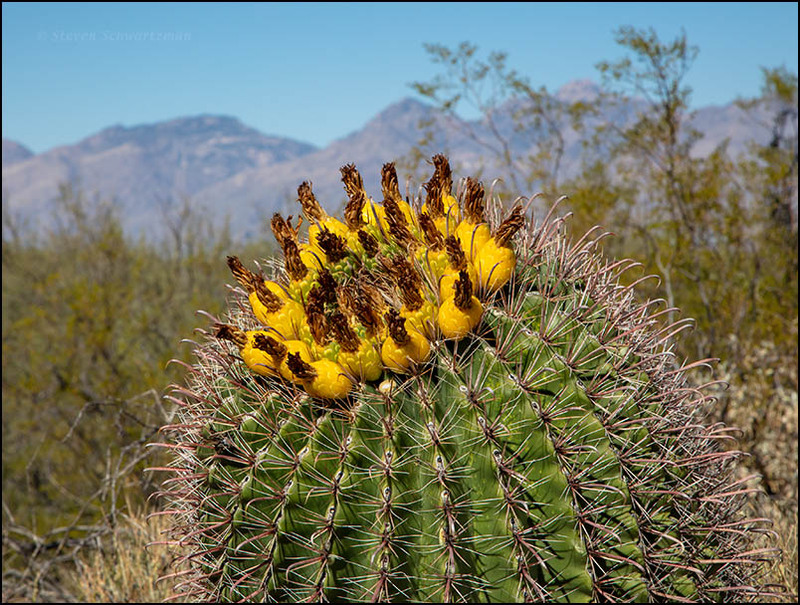 Barrel cactus and cholla live in Riverside County near Palm Springs, but the saguaro are farther south and east. Did you happen to see the desert fan palm? I don’t remember if I did. It’s possible I saw them without paying attention. Oh, you would have known if you had seen it. It is quite distinctive.